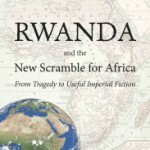 In Books Tagged In Africa, Central Africa, Congo, Democratic Republic of Congo, Kagame, Phil Taylor, Refugees, Rwanda, and Rwandan Patriotic Army. survival during which they travelled thousands of kilometers on foot from one refugee camp to another. Lacking food and water, they were often robbed, sometimes raped but were constantly pursued and bombed by shadowy Rwandan-backed armed soldiers with sophisticated weapons and aerial surveillance information. He and his family were among the more than three hundred thousand refugees who, for the most part, did not survive to tell their story. 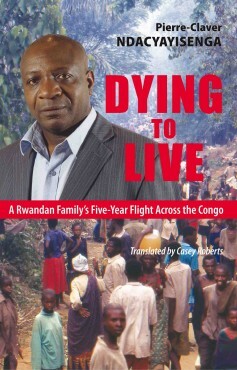 Dying To Live is an ode to the human capacity to survive against all odds. Pierre-Claver Ndacyayisenga brilliantly and touchingly tells a story that has been silenced for too long. It will help restore the humanity and the right to mourn to hundreds of thousands of Rwandans dispersed throughout the world. 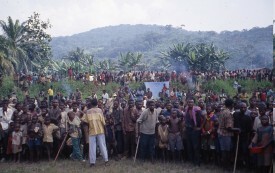 “The interest and power of his testimony resides in the story of an exodus, on foot, over thousands of kilometers, of wretchedly abandoned refugees, denied water and food, robbed, bombed, raped, exploited by so-called liberators, reduced to slavery, and forced to cross dangerous rivers by their own means, hide in the snake and animal-infested jungle, with only their faith as their only source of shelter and comfort.” Le Devoir, Montreal. Pierre-Claver Ndacyayisenga was born in Rwanda in 1962. He taught primary school before earning a degree in history from the Université nationale du Rwanda. A history teacher in Kigali, he was forced to flee with his family in 1994. Father of four children, he now lives in Montreal. Phil Taylor hosts the Taylor Report at CIUT, Toronto. 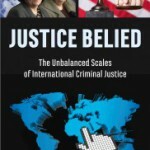 For ten years he was investigator for human rights lawyers including former US Attorney General Ramsey Clark and the late Charles Roach.